I learned that the tube lasts up to three months!! Intensify your eyelashes by unleashing the power of your natural lashes through Maximum Lash Eyelash Conditioner. This high performance conditioner is fortified with vitamins and peptides to strengthen and enrich your lashes. One bottle, if used correctly, will last three months and results may show in four to six weeks after recommended use. Once-a-day, at bedtime: apply a thin line of MaximumLash to your lashes, above the level of your skin. Remember, only a small quantity of MaximumLash is needed to promote the attractiveness of your natural eyelashes. One Brush stroke is sufficient. 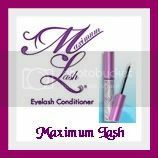 One winner will receive Maximum Lash Eyelash Conditioner. Tell me something you learned about Maximum Lash. I follow your blog on GFC user id Aline and would like longer lashes. MaximumLash is safe for contact lens wearers. I learned that they have not tested maxlash w/pregnant or nursing women so they advise against that. i learned that max lash thickens and lenthgens your lashes! i want it! I'm following your blog! Great giveaway! I've been wanting to try this!! I LEARNED THE FOLLOWING " Can I use MaximumLash on my eyebrows? follow GFC Kendra22--this might help the thin lashes I have! I am a GFC follower and would love to try this lash conditioner. I'm so fascinated by these eyelash growing products & would love to try this one! Google Friend Connect follower. I follow your blog with GFC and would love to try this product on some broken eyelashes. I learned that Maximum Lash has not been tested on animals. I follow on google friend and I would love this!! Some users have reported darker looking eyelashes. I am now a public follower via GFC (Stephanie). I learned that MaximumLash is safe for contact lens wearers.